The Sermon on the Mount is believed to be a sermon given by Jesus of Nazareth to his disciples, as recorded in chapters 5-7 of the Gospel of Matthew. The words epitomize Jesus moral teachings in the context of the Mosaic Law. While biblical literal interpreters believe these verses represent an accurate record of an actual speech given by the historical Jesus, critical scholars take it to be a compilation of sayings attributed to Jesus, some historical, some not. Recent scholarship has led some to conclude that the sermon was meant as a summary of Jesus' teaching for Matthew's Jewish-Christian audience. It emphasizes the need for continued obedience to most of the precepts of the Mosaic Law, and to go beyond the required major commandments. Some Christians believe that the Sermon on the Mount shows Christ as initiating a "New Covenant." That covenant effectively nullified the old Law of Moses. To many readers, the sermon contains the central tenets of Christian discipleship and is considered as such by numerous religious and moral thinkers, such as Leo Tolstoy, Mahatma Gandhi, Dietrich Bonhoeffer, and Martin Luther King, Jr.. Its teachings have also been one of the main sources of Christian pacifism. The best-known portions of the open-air sermon comprise the Beatitudes, found at the beginning of Matthew's reportage. The sermon also contains the Lord's Prayer and the injunctions to "resist not evil" and "turn the other cheek." Also, there is Jesus' version of the Golden Rule. Other lines often quoted are the references to "salt of the Earth," "light of the world," and "judge not, lest ye be judged." It concludes with an admonition not only to hear Jesus' words, but to do them, a teaching which some commentators find to be at odds with the Pauline emphasis on faith in Jesus as opposed to works as the key to salvation. The Gospel of Matthew groups Jesus' teachings into five discourses, of which the Sermon on the Mount is the first. Those accepting the ancient church tradition of Matthean authorship take the sermon as what it purports to be (Matthew 5:2), namely the actual words of Jesus given on the occasion described. Critical scholars tend to see portions of the Sermon on the Mount and the parallel Sermon on the Plain in the Gospel of Luke as having been drawn from a common "sayings source" document known as Q. Tending to confirm this idea is that fact that some of the sayings can also be found in the apocryphal Gospel of Thomas. However, others argue that the parallels in Luke tend to be very loose, and that the Gospel of Thomas could have borrowed the verses either from Matthew or Luke. 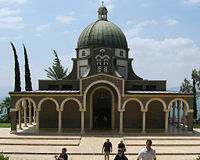 The Church of the Beatitudes, high on a northern hill overlooking the Sea of Galilee. Matthew sets the Sermon on the Mount near the very beginning of Jesus' ministry. After being baptized by John the Baptist (chapter 3), Jesus is tempted by Satan in the wilderness (4:11). He then learns that John has been arrested and returns to Galilee. There, he begins to preach the same message that John did: "Repent, for the Kingdom of Heaven is hand." In Galilee, Jesus gathers disciples and begins to attract a wider following as a healer and exorcist. News of his ministry spreads throughout the area, including not only the Galilee but also Syria, the Decapolis, the Transjordan, and Judea (4:2-25). In Matthew, the Sermon on the Mount is the first unique teaching of Jesus, distinct from the message already proclaimed by his forerunner John. Seeing the crowds, he walks up a mountainside and sits down; it is not the crowds whom Jesus addresses, but his disciples: "His disciples came to him, and he began to teach them" (5:1-2). Indeed, some commentators indicate that Jesus seems have gone up the mountain not to gain a better platform from which to address a large audience, but to escape those who have been attracted by his healing ministry, so that he may address his disciples in private. There are no actual mountains in this part of Galilee, but there are several prominent hills in the region to the west of the Sea of Galilee, and so a number of scholars do not feel "the mount" is the most accurate understanding of the sermon's setting. One possible location of the sermon is on a hill that rises near Capernaum. Known in ancient times as Mt. Eremos and Karn Hattin, this hill is now the site of a twentieth century Roman Catholic chapel called the Church of the Beatitudes. 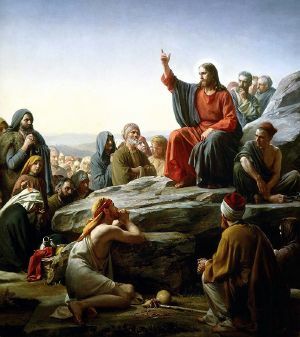 Introductory narrative (Matthew 5:1-2)—A large crowd assembles due to Jesus healing the sick, so he climbs a mountain and speaks to his disciples. The Beatitudes (Matthew 5:3-12)—A series of eight (or nine) blessings describing the character of the people of the kingdom, such as meekness, purity of heart, humility, being a peacemaker, and experiencing persecution. Metaphors of Salt and Light (Matthew 5:13-16)—This concludes the picture of God's people drawn in the Beatitudes, calling them the "salt of the earth" and the "light of the world." It includes a stern warning to those who disciples who faith to manifest these characteristics. Expounding of the Law (Matthew 5:17-48)—Jesus declares his commitment to the Mosaic Law "until heaven and earth shall pass away." His disciples must keep the commandments more carefully than the Pharisees do and must go even beyond the requirements of certain key commandments: not just "do not kill," but do not be angry; not just "do not commit adultery," but do not even look at a woman with lust; not just "love your neighbor," but "love you enemy," and so on. In total, the disciples must "be perfect as your Heavenly Father is perfect." 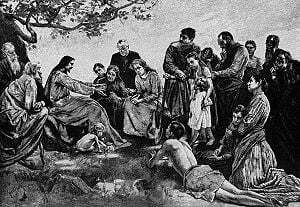 Discourse on ostentation (Matthew 6)—Jesus criticizes fasting, alms, and prayer when they are only done for show, and not from the heart. Within the context of his criticism of hypocritical prayer, Jesus provides his famous example of correct prayer, known as The Lord's Prayer. The discourse goes on to urge the disciples not to worry about material needs, but to seek God's kingdom first and store their "treasures in heaven." Discourse on holiness (Matthew 7:1-29)—Jesus condemns those who judge others before first perfecting themselves, encouraging his disciples to "seek and knock," for the way, though narrow, shall be opened to them. He warns against false prophets, for the "tree" is known by its "fruit." He concludes by urging his disciples to be not only "hearers" but "doers" of his teachings, for mere "hearers" build on a shifting foundations while "doers" built on solid rock. The Sermon on the Mount is one of the most debated works in all of literature, let alone the Bible itself. One of the key points in the debate has to do with its relationship to traditional Judaism. 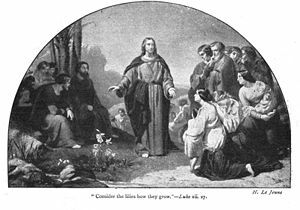 Many Christians believe that Jesus presented a "new law" in the Sermon on the Mount, to replace the "old law" of Moses. The reference to going up a mountain prior to preaching is considered by many to be deliberate reference to Moses on Mount Sinai, fitting with a consistent theme in the Gospel of Matthew to present Jesus as a new Moses. Do not think that I have come to abolish the Law or the Prophets; I have not come to abolish them but to fulfill them. I tell you the truth, until heaven and earth disappear, not the smallest letter, not the least stroke of a pen, will by any means disappear from the Law until everything is accomplished. Anyone who breaks one of the least of these commandments and teaches others to do the same will be called least in the kingdom of heaven, but whoever practices and teaches these commands will be called great in the kingdom of heaven. For I tell you that unless your righteousness surpasses that of the Pharisees and the teachers of the law, you will certainly not enter the kingdom of heaven (5:17-20). The Absolutist View take the sermon as saying precisely what it says about such things as moral perfection and facing persecution. If obeying the scripture costs the welfare of the believer, then that is a reasonable sacrifice for salvation. Others have dealt with the issue by Modifying the Text of the sermon. In ancient times this took the form of scribes actually altering the text of the Sermon to make it more palatable. Thus some early copyists changed Matthew 5:22 from "whosoever is angry with his brother shall be in danger of the judgment" to the watered-down "whosoever is angry with his brother without a cause shall be in danger of the judgment." "Love your enemies" was changed to "Pray for your enemies," and so on. More common in recent centuries is to paraphrase the sermon and in so doing make it far less radical. The Hyperbole View argues that portions of what Jesus states in the Sermon are exaggerations. Matt 5:29-30—commanding that believers gouge out their eyes and cut off their hands if these cause sin—is the most prominent example, but there is disagreement over exactly which sections should not be taken literally. The General Principles View argues that Jesus was not giving specific instructions, but general guidelines of how one should behave. The Double Standard View divides the teachings of the sermon into general precepts and specific counsels. The great mass of the population need only concern themselves with the precepts; the counsels must be followed by only a pious few such as the clergy and monks. The Two Realms View, proposed by Martin Luther, divided the world into the religious and secular realms and argued that the sermon only applied to the spiritual. In the temporal world, obligations to family, employers, and country force believers to compromise. Thus a judge, for example, may need to sentence a criminal to death, but inwardly, he should mourn for the fate of the criminal. The Analogy of Scripture View holds that the more rigid precepts in the sermon were moderated by other parts of the New Testament. For instance, both the Old and New Testaments hold that all people sin, so the command to "be perfect" cannot be taken literally, and even Jesus himself did not always obey the command to refrain from being angry with one's brother. The notion of Attitudes not Acts holds that, while no one can live up to the Sermon on the Mount completely, it is one's attitude that matters most rather than the external deeds themselves. The Interim Ethic View sees Jesus as being convinced that the world was going to end in the very near future. Thus, survival in the world did not matter, as in the end times, material well-being would be irrelevant. Although it was known earlier, Albert Schweitzer particularly associated with popularizing this view. Another German thinker, Martin Dibelius, presented the Unconditional Divine Will View, which holds that although the ethics behind the Sermon are absolute and unbending, the fallen state of the world makes it impossible to live up to them. Humans are bound to attempt to live up to them, but failure is inevitable. This will change when the Kingdom of Heaven is finally realized. The Repentance View holds that Jesus knew that the precepts in his sermon were unattainable, and that it was meant to stimulate repentance and faith in the Gospel, which teaches that we are saved not by works of righteousness, but faith in Jesus' atoning death and resurrection. Another Eschatological View is that of modern dispensationalism, first developed by the Plymouth Brethren, which divides human history into a series of ages or dispensations. Although we are currently living in an age where teachings of the sermon is impossible, in the future Millennium following them will be a prerequisite to salvation. The Sermon on the Mount may be compared with the similar but more succinct Sermon on the Plain as recounted by the Gospel of Luke (6:17–49), which occurs at a similar moment in Luke's narrative, although Luke first provides additional details about Jesus' work in and around Nazareth. In Luke's version, Jesus ascends a mountain to pray with his disciples and then comes down and delivers his sermon to a large crowd in a level place. Some scholars believe that this is simply Luke's account of the same sermon, while others hold that Jesus simply gave similar sermons in different places, as do many preachers. Still others hold that the two "sermons" represent the two authors; different ways of presenting a number of sayings of Jesus recorded in the Q document as if they were part of a single sermon (Ehrman 2004, 101). The Sermon on the Plain is generally shorter and pithier than the Sermon on the Mount. One exception to this is that in Luke's version, Jesus adds four "woes" to the blessings of the Beatitudes, cursing those who are rich, those who are fed, those who laugh, and those disciples who are praised by the general population. Ehrman, Bart D. The New Testament: A Historical Introduction to the Early Christian Writings. Oxford, 2004. ISBN 0195154622. Fox, Emmet. The Sermon on the Mount: The Key to Success in Life and the Lord's Prayer: An Interpretation. 1989. ISBN 0060628626. Kissinger, Warren S. The Sermon on the Mount: A History of Interpretation and Bibliography. Metuchen: Scarecrow Press, 1975. ISBN 9780810808430. Kodjak, Andrej. A Structural Analysis of the Sermon on the Mount. New York: M. de Gruyter, 1987. ISBN 9780899251592. Lapide, Pinchas. The Sermon on the Mount, Utopia or Program for Action? Translated by Arlene Swidler. Maryknoll: Orbis Books, 1986. ISBN 9780883442487. McArthur, Harvey King. Understanding the Sermon on the Mount. Westport: Greenwood Press, 1978. ISBN 9780313205699. Prabhavananda, Swami. Sermon on the Mount According to Vedanta. 1991. ISBN 0874810507. History of "Sermon on the Mount"
This page was last modified on 8 September 2015, at 19:31.